Did FTIL violate holding company norms? Commerce, Industry & Textiles Minister Anand Sharma referred to the award winners as representatives of the dauntless spirit of Indian entrepreneurship. And, from start to finish, the ceremony of the Business Standard Annual Awards for 2013, held here on Saturday evening, toasted a resurgent India, which has developed a robust ecosystem that can fight all odds. The ballroom at Palladium Hotel, filled to capacity by familiar faces and famous names, clapped in unison when Sharma said the spirit of Indian entrepreneurship was best exemplified by the fact that Indian businesses had gone to every continent of a world shrunk by technology. "India is in safe hands, given the fact that we have over 800 million people below the age of 35, and 620 million below the age of 21. This young nation beckons the world," he said. In a dig at those who cry slowdown at the drop of a hat, the minister said many positives in the past decade had perhaps been deliberately overlooked in the shrillness of criticism about India's economic slowdown. For example, the economy grew from $500 billion to about $2 trillion over the past decade, while per capita income nearly trebled. At the same time, the country pulled 140 million people out of poverty, the fastest decline in poverty in post-Independence India. Also, life expectancy for men increased by five years and for women by six. 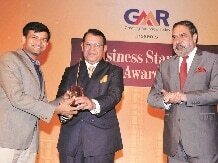 The entrepreneurial spirit Sharma referred to was best exemplified by redBus.in chief executive officer (CEO) Phanindra Sama, selected winner of the Most Innovative Company of the Year award by senior editors of Business Standard. In his acceptance speech, the 32-year-old BITS Pilani graduate said the idea of an online bus ticketing service came to his mind after he missed a bus and redBus' success was a testimony to today's business environment, which supported budding entrepreneurs. "Venture capital funds put in money, mentors came forward, many senior executives also joined the company. This would not have been possible without the ecosystem today," he said. Today, redBus is the second-highest-transacted travel website, after IRCTC. Sandeep Engineer, managing director of Astral Poly Technik and winner of the Star SME of the Year award, talked about his company's journey from near-bankruptcy to becoming India's largest plumbing systems manufacturer. "The award shows when you put in hard work, the ecosystem recognises that," he said. Their response was typical of the evening, one where the leading lights of the business world walked away with glittering trophies and, to the last person, thanked their respective companies, colleagues, customers and families for helping them to the top step of the podium. The corporate award winners were chosen by a distinguished jury, led by ICICI Bank Chairman K V Kamath. The other members were KKR CEO Sanjay Nayar, Amarchand & Mangaldas Managing Partner Cyril Shroff, McKinsey India MD Noshir Kaka, Future Group Founder & CEO Kishore Biyani and Marico Chairman Harsh Mariwala. The recipients of the awards did themselves proud with the quality of their acceptance speeches. Tata Consultancy Services CEO & MD N Chandrasekaran, the winner of the CEO of the Year award, said every industry, society and government would witness transformation. "Business processes will be re-imagined, business models will be re-imagined and the way the governments are run is going to be re-imagined." Under Chandra, as he is commonly referred to, TCS has not only bettered the Indian information technology industry's growth rate. It is also ranked among the top four most valuable IT services brands worldwide by Brand Finance, a leading brand valuation firm. The CEO said TCS had an "incredible opportunity" in the future, since "the tech industry is going through a massive transformation. The rate at which the technologies are hitting us is just unbelievable." 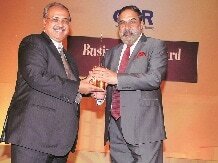 Sun Pharmaceutical won the coveted Company of the Year title. It has grown at an enviable rate in the past couple of years, helped partly by acquisitions at attractive valuations. Led by Dilip S Shanghvi, its net sales have risen at an annual rate of over 40 per cent in the past three years, while profit growth was 37 per cent. Accepting the award, Shanghvi said: "Our focus is to provide high-quality pharmaceuticals to patients in more than 40 countries at costs that are significantly competitive compared to large multinational companies. We will do our best to justify this honour." The Star MNC of the Year award went to Hindustan Unilever, which transformed itself and doubled its market capitalisation in three years, despite its size. Accepting the award, Pradeep Banerjee, HUL's executive director (supply chain), talked about how the company's belief in doing well by doing good had paid off. Bharat Petroleum Corporation bagged the PSU of the Year award for being innovative in its business of refining and marketing, and making a successful foray into oil & gas exploration. The award was received by BPCL Chairman & Managing Director S Varadarajan, who said the company would continue to serve its customers with more innovations. The Banker of the Year award went to Aditya Puri, MD & CEO of HDFC Bank. Apart from its industry-beating performance, Puri's theme has been "never allow a retail customer to overborrow and refrain from lending to firms that have overleveraged themselves". Puri's greatest strength, according to a separate jury led by Subir Gokarn, former deputy governor of the Reserve Bank of India, was his ability to have the same quarterly consistency in credit growth across cycles. The award was accepted on his behalf by the bank's treasurer, Ashish Parthasarathy. The other members of the jury were Mahindra & Mahindra Financial Services Chairman Bharat Doshi, Ican Advisors Chairman Anil Singhvi, former Bank of Baroda CMD M D Mallya and DSP BlackRock Investment Managers President & Chief Investment Officer S Naganath. The Debt Fund Manager of the Year award was given to Umesh Sharma and Sachin Padwal-Desai of Franklin Templeton AMC. This was Padwal-Desai's second win in the category. The optimism about the future was also evident in the acceptance speech of S Naren, chief investment officer at ICICI Prudential Asset Management Company, who was named Equity Fund Manager of the Year along with his colleague, Fund Manager Mittul Kalawadia. "I am sure that next year we will be referring to the start of a recovery and not a time of slowdown. I think that is behind us," Naren said. The winners in the best fund manager category were selected by a five-member panel led by former Sebi and LIC chairman G N Bajpai, former State Bank of India chairman Pratip Chaudhuri, Ernst & Young senior advisor Ashvin Parekh and IndAsia Fund Advisors Chairman Pradip Shah.